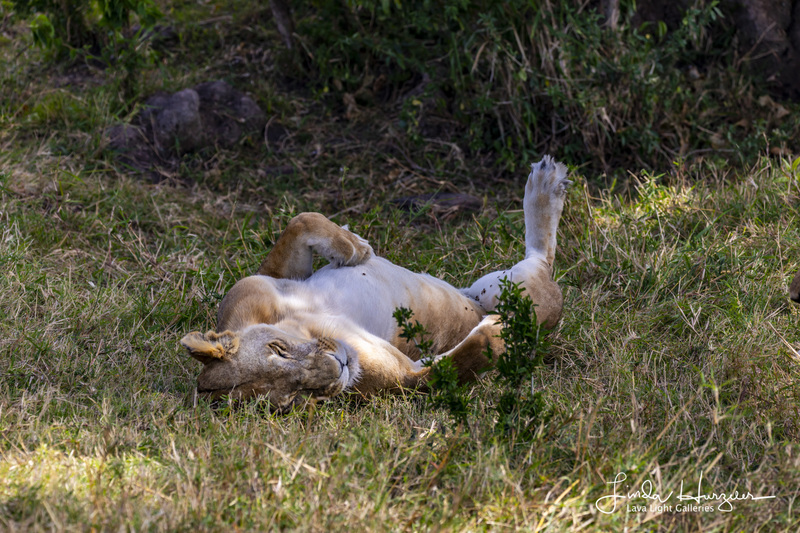 One afternoon on safari, we drove up on a male and female lion sleeping in the grass near a water hole. Our driver suspected something was going on and stayed longer than I expected. We were maybe ten feet away, so we were happy to take a few shots in hopes that one of them would get up and give us a pose. We got more than we hoped for…much more. The male lion got up and went directly to the female. Our driver said…”They are going to mate.” He got that right. No foreplay. No discussion. Just had at it. Quite the sight. The whole act took about a minute. I was not all that impressed, nor was the female lion. However, the driver advised us that there would be a follow up performance in ten to twenty minutes…and that they would continue at that pace FOR DAYS. Now that IS impressive. Sure enough, about twenty minutes later, round two. Another quicky, but the female seemed a bit happier this time around. I was determined on this trip to finally get at least on succinct and properly shot video…so I turned the camera to video mode and hit the button. I am the single worst videographer in the world, but I actually did a great job on the one minute video and figured out how to edit out the two second “out of focus” moment that I managed to do right in the middle of the action. My first ever decent video. Wish I had videoed round one…it ended in a huge roar from the male lion and that face you see in the second photo. Caught two giraffes in the act later that day…that was also quite a sight. Aloha. Posted in Uncategorized on October 15, 2018 by Lava Light. ← Previous: "Warning….Graphic Content…Blood and Guts Lions Eating Lunch…In Four Photos"